As this one was for "two yellows" does that absolve him from anything extra to the usual one game ban for that totting up offence? I don't know. As I said the other day, he is desperate to make his move here from The Pirelli permanent and it is understandable that he no longer wishes to "wear the armband" after his experiences there, even if the spiritual leadership of the team is his and he has obviously earned the respect of all concerned as I always believed he would. If we had succeeded in signing him pre-season and had him "running t'ings" out on the field instead of a puffing and panting Greavsie, we would have established ourselves much sooner. His importance and influence on the squad cannot be over estimated. I think it depends on the club you're visiting. Yesterday was always going to be one of those matches when it would be wiser not to wear colours. But as you say you should be free to wear club colours. Beer, the emotions and the moronic on both sides spoiled yesterday a bit but I certainly wouldn't class class Grimsby fans in the same bracket as Oxford. I think that they were just upset that yesterday's result all but guaranteed their drop into the Conference. But it's a proper football club and I hope that they come back into league football sooner rather than later as I don't want it to be my last visit to Blundell Park for all it's faults. I guess that the club will be staying there now for the time being although planning permission has been granted for the new stadium so we might not get the chance to go there again. Another ground with a bit of character. Some good match reports and photos! 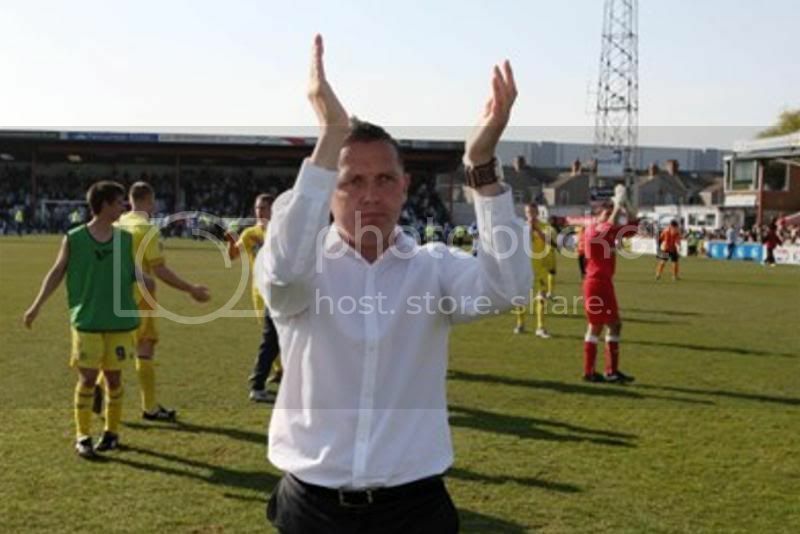 I can't help but draw some parallels with the Dagenham match back on that sunny day last August! The goals that day were from a Wroe penalty, fox in box Benyon and a great individual effort from Carayol. The full backs were Nicholson and Robertson. I know Grimsby are no Dagenham but the current side have beaten the best in this division, so why the change in fortunes after we were ripped apart that day? Well, apart from the full backs only Wroe and Rendell also started that day. Apart from two early goals, Rendell didn't get going until the end of November and that coincided with Sills losing his place and Zebroski joining the side. Wroe hasn't had a great season but the arrival of Mansell has certainly seen an upturn in his all round game! Two of the substitutes at Dagenham were Benyon and Carayol, two young players that have improved and stepped up to the plate in the latter part of the season. Many questioned Benyon's contract extension back in January. I would dare, no double dare anyone to criticise (constructively ;D) that decision now! As for Carayol, maybe attack is the best form of defence while Nicholson is behind him. Many players have come and gone but two gems were unearthed in Branston and Zebroski. Since Branston came into the side, just 14 goals conceded in 16 games! The Lincoln game was the only bad day at the office. Ellis has always been quality in many fans eyes but his partnership with Pickles just seems to have clicked! As for Zebroski, although his goals have dryed up, a quality player at this level, contributes massively defensively, a threat on the wing and maybe no coincidence that Rendell has been scoring at a rate of a goal around every two games since his arrival. So, although there has only really been two new outfield players brought in since last August that are currently making significant contributions, this combined with marked improvement in some of the younger players, together with positional changes has rejuvenated a side that as our goal difference attests, was never that far short of the mark into a team that can beat anyone in the division. Confidence is always a factor, against Grimsby at home we were appalling, yesterday, it seems we took our chances as opposed to missing a hatful earlier on in the season . To be fair, if the Grimsby fans’ forum is to be believed, they thought our supporters were pretty restrained, on the whole, in our attempts to 'rub it in'. In any case, their chavs who invaded the pitch and headed towards the away end (before apparently going back into the home ends to fight amongst themselves) were from the other end of the pitch. So unless they had binoculars, it's highly unlikely it took any w----- signs or other gestures to incite them. I enjoyed my time in Cleethorpes before and after the game. I don't think the English Riviera has anything to worry about, but the views across the Humber Estuary to Spurn Head were very fine indeed, and the haddock and chips weren't bad either. I thought the game followed a similar pattern to our previous games. We harried the opposition, kept most threats at bay, and then took advantage of our chances when they came. I thought we were very physical, and some of the tackles, from Branston, Mansell and Zebroski in particular, were as strong as they get. There were three or four occasions during the first half alone where Grimsby players were left in a heap after uncompromising tackles. Perhaps this accounts for the views of Grimsby fans who believe their players 'weren't as up for it as they should have been'. Our back four looked solid, and Nicho's throws and crosses always looked threatening. The great thing about Nicho is that he gives the opposition something extra to worry about, especially when our wingers are on their game as they are at the moment. The midfield partnership did well. I was impressed with Mansell in particular who in my view put in a cracking performance at Aldershot too. Nicky Wroe put away his penalty well and put in a generally solid performance, but I'm unsure if he's done enough, even in these last few games, to convince me that he is a consistently effective League 2 footballer. Zebroski and Carayol were impressive, both tracking back and defending. Carayol looks dangerous every time he gets the ball, and his goal was superb. I remember seeing him at Woking last season and how frustrating it was seeing a player who clearly had bags of skill fluff up his final ball and fail to track back. Benyon and Rendell worked superbly together, and as a person who has touted Benyon as a 'supersub' rather than a match starter, he’s certainly proving me wrong. I was impressed with Rendell's work rate; him and Benyon work well together. 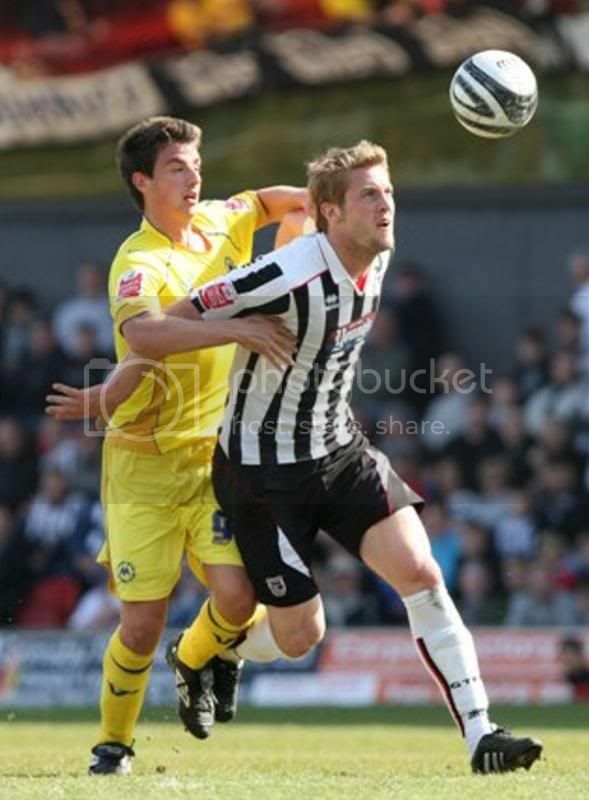 Whilst our pick up in form co-incided with the arrival of Guy Branston, the return of Rendell was as important too imo. Great to have League 2 football secured with three games to spare. Let's hope the board begin the important work of contract negotiations and plans for next season. Better late than never!! Just got back from my 80's weekend in Skegness ......highlights were Bad Manners and 3 music nights. Also the meals and abundance of scantilly clad women was a plus!! But the highlight without doubt was my day visit to Cleethorpes. I think all has been reported but it was great to witness our safety confirmed first hand. It was a fantastic team display and just a great shame that our celebrations were cut short. Walking back to the car was a little fraught (I think the grin on my face gave away who I supported!!). In summary a fantastic few weeks----which goes to show you cant predict this great game of ours!! This is the best match report I have read all season, apart from my own of course, although I do remember writing one quite similar (in Stuart Hall style like this) for a Capital Gulls magazine many years ago. I have received via email a match report from one of our younger supports, a young man called Adam who is 13 years old. He wrote his report on the journey home and sent it to the forum and I'm delighted to use it and I think we have a very good young match reporter in the making. many thanks Adam for sending it in and letting us all get to read it. WE ARE A FOOTBALL LEAGUE CLUB – FACT!! Well this season has definitely seen its ups & downs but now we have our reward! Buckle may have been critised but he has kept us up, enough said there. Now the game was definitely one of two halves, with Grimsby dominating but not creating too much but much of that was due to our expert closing down. We pressed high up the pitch with Benyon running his socks off for the whole of the first half. In the second half we upped our game into more of an attacking one and early in the second half Benyon was bought down for a controversial penalty. To the utter delight of the travelling Gulls Fans Nicky Wroe stepped up calmly to take the spot kick and slotted the ball into the centre of the goal!! We then went from strength to strength and just a few minutes later the in form Gambian winger went on one of his amazing ‘runs’ and crossed the ball for Benyou who smacked the ball into the top corner of the goal, Torquay now two up!! But then the game took a turn for the worse when hot headed Guy Branston picked up his second ‘yellow’ of the match and was sent off. At 10 men it was a case of hold on but then up came Carayol who went on an incredible run and had the finish to match, Torquay 3 – 0 up so surely we are safe now! No way, not if Grimsby have any thing to say about it, with their Football League status at risk they put up an incredible fight with a number of near misses, but Torquay did not just sit back Rendell & Wroe both came close to scoring. At the final whistle there were Grimsby's tears and Torquay's joy, the Grimsby fans let out their frustration by around 500 of their supporters invading the pitch towards the ‘yellow army’ but the stewards had everything in control. Overall a great day out just not sure about the 6 o’clock start!! Many thanks to Tony Uren for the transport!